It's hard to impress a living legend, but that was what Filipino artist Erwin "Weng" Dayrit did when he met boxing icon Manny Pacquiao last year. A photo of Weng and his hand-drawn portrait of the People's Champ, which he personally gave to Pacquiao as a gift, recently trended on Reddit. His artwork is special fan-made memorabilia—the level of detail in the colored illustrations are a clear indication of his inherent creativity. "Nakita lang sa Facebook ng isang taong may connection kay Manny tapos yun, ipinatawag ako," Dayrit shared in an interview with FHM.com.ph, when asked how he met the famous boxer. "Gustung-gusto niya. Na-compare pa nga sa paintings na binigay sa kanya ng ibang artist kaya sobrang saya talaga." 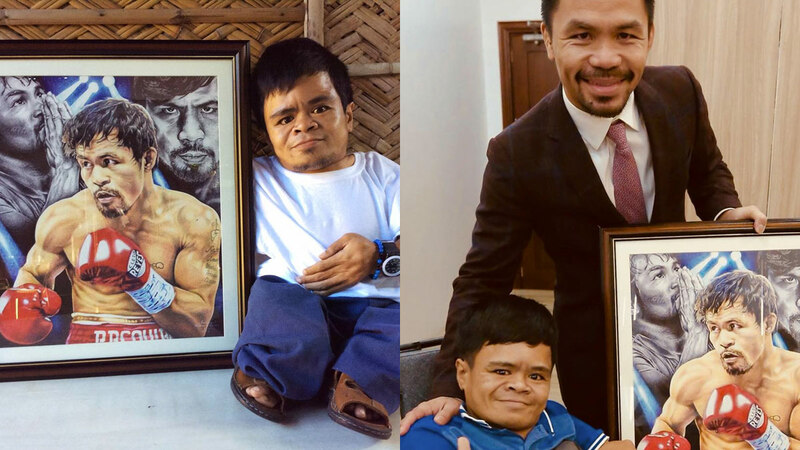 What makes his Pacquiao painting more remarkable is the fact that the Pampanga-based artist was able to come up with such a fine piece of art despite being born with Osteogenesis Imperfecta, more commonly known as brittle bone disease, which is the reason for Weng's fragile bones and short height at 38 years old. Being a wheelchair user also didn't stop him from pursuing his childhood hobby of drawing, especially with a supportive family rallying behind him. He even completed a drafting course at Don Honorio Ventura College of Arts and Trades (now Don Honorio Ventura Technological State University), before putting up his own art and sign shop. Dayrit is more than independent and functional—he assists his community in its artistic needs (he designed the altar of San Agustin Parish Church). It wasn't until sales dropped due to the digital age that Weng decided to go full-time as a visual artist. He explained, "Malaki ang epekto ng technology sa ganung business kasi mas mabilis at mas marami ang pwedeng ma-produce." Back then, he was a member of local art organization Guild for Upholding and Harnessing Indispensable Talents aka GUHIT Pinas, where he was welcomed with open arms and praised for his work—something that he didn't experience as a kid who was teased for being different. The online community also introduced him to the ballpoint pen medium, which he admittedly found more challenging but at the same time more fulfilling because of the amount of effort needed to create a full piece of art. Dayrit recalled his first time using pens to render his pieces, saying that skin tone and hair detailing were the hardest parts to put finishing touches to. Once he mastered the art of ballpoint, it was viral artwork after viral artwork from there. Before Weng's Pacquiao portrait took social media by storm, his Apo Whang-od masterpiece had already garnered more than 15 thousand likes and 10 thousand shares. Dayrit's aspirational story has been featured on Kapuso Mo, Jessica Soho and Magpakailanman, where he played himself. Aside from winning several poster making contests, he has also received numerous awards: Outstanding Fernandino (2011), Bahay Kubo Sining Foundation-Natatanging Alagad ng Sining (2016), and GUHIT Pinas Artist of the Year (2017). He is living proof that if you dedicate yourself to your craft, you can win at life. Despite all the ups and downs he has experienced, Weng perservered. He never gave up because he knew that others haven't given up on him. His advice to aspiring creatives: "May kapansanan man o wala, dapat palagi tayong humble, kasi kahit gaano pa tayo ka-galing kung pangit naman yung attitude, wala rin. At saka practice lang nang practice."